Provide comfort for the family of Beverley Maxwell with a meaningful gesture of sympathy. After a long and healthy life, Beverley passed at Grey Gables Nursing Home on Thursday, April 11, 2019 in her 99th year. She is reunited with her husband “Bill” William who passed in 1992. 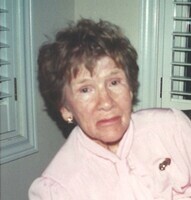 Loving mother of Doug(Marlene) of Maxwell and Anne Waldes(Leo Rock) of Stoney Creek. Loved and remembered by her grandchildren Jason Maxwell, Shellie(Kevin) Sherson, Max(Mina) Waldes, Leah Waldes and great grandmother of Megan and Mya Shearson, Ethan and Oliva Maxwell. Dear sister of June Morgan of Toronto and sister in-law of Nancy Reid of Toronto. Predeceased by her brothers Wallace, Melvin and Doug Reid and sister Aileen Daniels. Beverley was born January 14, 1921 in Toronto to James and Gladys Reid. She worked as a Nanny in the GTA and attended Danforth Tech, studying to become a dietician until she met and married the love of her life, Bill. They married May 27, 1944 and moved to the farm at RR2 Proton Station where they raised their two beautiful children. They shared many years of happiness there, farming, before they built their retirement home on the property next door. Beverley was an active member of St. Paul’s Anglican Church Ladies Guild and Maxwell Senior Citizens Group. To send flowers in memory of Beverley Margueritta Maxwell (Reid), please visit our Heartfelt Sympathies Store. Your friends at Hamilton Port Authority sent flowers to the family of Beverley Margueritta Maxwell (Reid). We knew Mrs Maxwell from several visits to her home in Hamilton whilst living very happily with her daughter Anne and the family. Mrs Maxwell was an adorable, sweet lady who was only ever a delightful individual. Our love and thanks to her will resonate throughout our lives. We offer our condolences to those she leaves behind. In particular to sweet Anne Waldes and her remarkable children Leah and Max. My Condolences to Anne and family. Mrs. Maxwell was a lovely lady. May she rest in peace. Dearest Anne, Leah, Max and family, My deepest condolences for your loss. She was a classy lady and I’m fortunate to have met her. I shall miss her special and unique laugh which I shall cherish. Rest In Peace Mrs Maxwell! Sincere Sympathy Doug & Marlene, Shellie &Kevin and all the Maxwell family.